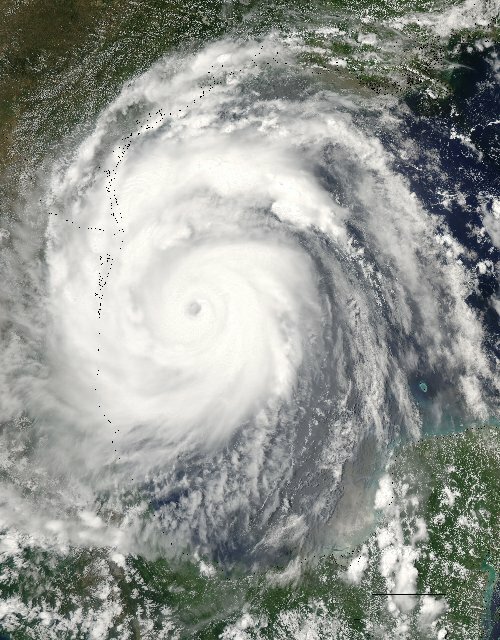 By the time Emily made her appearance in the second week of July, the 2005 Atlantic season had already produced four named storms (tropical storm strength or better) and was on its way to a record breaking performance. So it was hard to stand out from the crowd that year, but Emily sure did. Emily formed the way many of the strongest tropical cyclones do in the Atlantic – as a tropical “wave” or disturbance that left the coastline of Africa on July 6. She struggled at first to get her act together, as dry air penetrated her core and the upper level winds in the area kept trying to rip her apart. But Emily kept it together long enough to obtain tropical storm status on July 11. But the fun was just beginning. The next day, the “steering winds”, or the upper level winds in the atmosphere that push the system along, increased in intensity. Emily’s forward speed increased from a sluggish 10 kt. to a quite respectable 17 kt. Although this initially made Emily’s environment less favorable, recon planes noticed her winds at the surface unexpectedly began to increase. Everything seemed to fall into place and just 2 days later Emily was a major Category-4 hurricane with maximum winds near 115 kt. As Emily passed south of Jamaica, the records began to fall. She became the earliest (since records began in the 19th century) tropical cyclone to reach Category-5 status. Furthermore, Emily to this day is the only known storm to ever achieve Cat-5 intensity in the month of July in the Atlantic. Fortunately, Emily spent most of her time over the ocean when she was strongest. But she did pass directly over Grenada, Cozumel Mexico, and northeastern Mexico near San Fernando. Damage was unexpectedly light in the Yucatan, with mostly minor wind damage and flooding reported. Northern Mexico appeared to receive the worst of the storm, with 90,000 people driven from their homes and thousands of buildings destroyed. Miraculously only 6 deaths were reported from the storm, 4 in Jamaica when a car was pushed over a cliff from flood waters. Go to Cyclone Center today and start classifying Hurricane Emily. She was truly a memorable one. Much of the information given here and more can be found in the U.S. National Hurricane Center tropical cyclone report for Emily.